Kent is steeped in history and heritage and renowned throughout the world as the Garden of England. With golfers however, it would be more renowned as the home of some of the World’s finest golf courses. One of those great courses is the magnificent Prince’s Golf Club. With its 27 holes of championship Links, it hosted the Open Championship in 1932 and is currently an Open Qualifying Course. The three nines, The Shore, The Dunes and The Himalayas, provide a real test of golf especially if the wind is blowing in off the sea. The greens are fast and true and the bunkers and rough are very punishing. Prince’s Golf Club was founded at the beginning of the last century by Sir Harry Mallaby-Deeley. This lovely man decided to establish a new Links at Sandwich that would, in particular, welcome lady, junior and family golfers. Just five years after the club opened it hosted the 1912 English Ladies Open, which was won by Miss M Gardner and ten years later, it hosted the 1922 Ladies Open, won by Joyce Wethered. Since then, the club has hosted many women’s Championships, including the Curtis Cup and the British Ladies Open. Prince’s today is still one of the friendliest and most welcoming golf venues anywhere. The atmosphere around the clubhouse is relaxed, golfers – men, women and juniors who share a love of golf – sit around enjoying a drink and exchanging post-mortems about their round. The clubhouse staff are warm and welcoming and the food superb. Prince’s has recently just opened fabulous new luxury apartments, The Lodge at Prince’s. Formally the site of Old Clubhouse which is located in the heart of Sandwich Bay, the luxurious apartments provide beautiful en-suite accommodation with stunning views across the golf courses of Prince’s and Royal St George’s and to the east across the bay of Sandwich. The quaint village of Sandwich is one of the best-preserved medieval towns in England and well worth taking some time to explore and visit an Inn or two! Just a short drive from Sandwich is the town of Deal where we enjoyed some great seafood in Dunkerley’s, a lovely little family-run hotel overlooking the seafront. There is so much to do and see for the non golfer and golfer if you add a few days to your trip! The city of Canterbury boasts a wealth of visitor attractions. The Cathedral, St Augustine’s Abbey and St Martin’s Church form the World Heritage Site, but there are also many other excellent attractions in the city too, including river tours, museums and walking tours to name just a few. The Garden of England’s orchards and farms are a natural larder for fresh fruit and vegetables, even ice cream. Simply Ice Cream is a small family business run by Sally Newell and her mum using only local ingredients and natural flavours. With flavours to die for it’s not surprising that they now supply over 180 outlets in the South of England. Kent is also world famous for its tradition of excellent hops and the superb range of great tasting beers produced. Hotels and restaurants support local growers by using their wonderful fresh local produce. After spending a few days playing golf and sightseeing we travelled with P&O ferries from Dover to Calais. The crossing was very smooth, we were served a lovely meal in the ship’s restaurant and as we were finishing our coffees, we were called back to the coach and, within minutes, were heading down the coast of Northern France. The Pas de Calais is a hugely popular golf destination as the region has some of the best courses in France. P&O Ferries have 23 crossings a day so travelling to Northern France has never been easier, making it the perfect place for a French golf trip and, of course, equally perfect for the French who want to play Kent’s wonderful courses. The Cote de Opale [The Opal Coast] has so much to offer, beautiful French towns and villages, stretches of white sandy beaches, golf courses, restaurants serving traditional dishes made from regional produce, fresh fish, meat, poultry and vegetables, as well as the famous local juniper gin, wine and beer. Two days was not long enough. I felt the need to book a week or two or maybe just move! 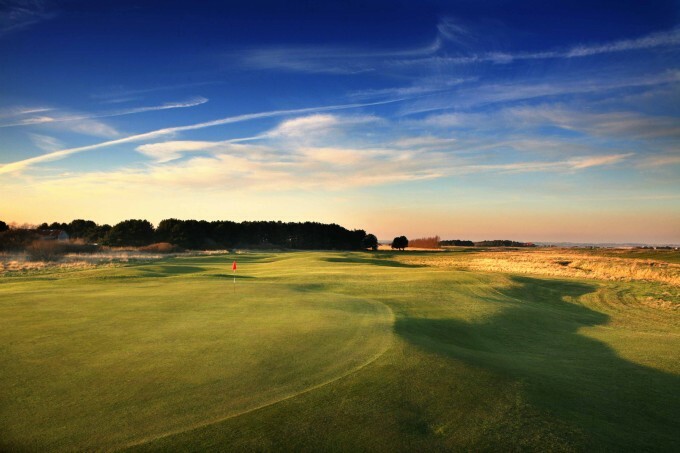 Courses in the Pas de Calais region feature gems such as Golf du Touquet, the ‘La Mer’, Golf d’Hardelot, Golf de Belle Dune and the challenging European Tour venue, the Saint-Omer Golf Course, as well as Golf de Wimereux. Wimereux Golf Club, a beautiful links course which is over 100 years old, is situated north of Boulogne and is surrounded by breathtaking scenery. The course is challenging – especially on a windy day! Its sand-based fairways guarantee excellent playing conditions all year round. Everyone in our group enjoyed the course and after 18 holes of play in breezy conditions, were ready for the wonderful food and of course fabulous wine that was served! The friendly and relaxed atmosphere at Wimereux made a perfect golfing experience. Thanks to P&O ferries we can easily experience both cultures, golf both sides of the channel, and enjoy amazing food in great company. From Belfast Flybe now fly direct from Manston Airport, Kent.